Nick's Hap Blanket: Frustratingly, I knit on most of the border on the "private" side of the work and only just realized it last night. Nick, dear man, of course said he wouldn't care which way the border faced, but I do, so RIP! This may be in time-out for a little while. The CC stripes are so beautiful on the public side that they have to match, center and border. Knit tie project for Dad: Yes, Father's Day presents are late this year. And I'm working this idea out to be a pattern, so it takes time. But I think it will turn out nicely. My sweater in Schaeffer Nancy: All done but the neckline, and I think I've figured out what I want to do, so some Seed Stitch and picking up of stitches is in my near future. In the meantime I may wear the sweater today anyway - it is cosy and the weather is chill and damp. Gerda Stole: I started this one for a friend as a "thank you" but our friendship is on the wane and I've messed up the current row, so there's not much motivation right now, though I like all the FOs I've seen. 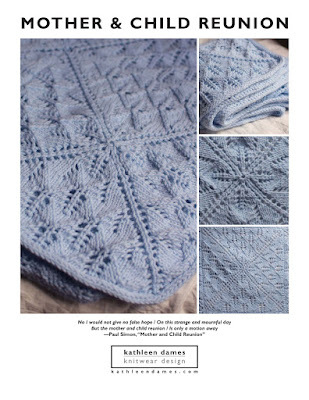 I think I prefer lace that repeats in much smaller doses so that I can knit without consulting the chart five times in a row. My First Socks: Alright, I've finally gotten to the ribbing at the top on the second one. Embarassingly close, I know. And then there are the projects for which I have yarn here. It's hard being away from the stash, but I'm surviving. Guess all that will keep me busy. Man, I'm frustrated about the edging on the Hap Blanket. I can't believe I didn't notice before row 25 (of the 36-row edging). Sigh. Oh, well, that's the way the cookie crumbles. I'm off to read Eloise in Moscow with Isobel while Penelope naps. Enjoy your day! P.S. Sorry there are no pictures! I couldn't bear to snap the incorrect Hap Blanket. Plus, I'm working on Nick's machine, since mine won't pick up the Wi-Fi signal. Sigh. Wait! Have you ripped Hap yet? Can't you cut it at that row, turn it right side up, and then graft it? I can help you!